PHILIPSBURG - St. Maarten Nature Foundation teamed up with cruise passengers from Princess Cruise Lines, Fathom Travel and Carib Resorts in cleaning garbage and hurricane debris from Guana Bay Beach, St. Maarten’s most critical turtle-nesting beach and one of the beaches hardest hit by Hurricane Irma. Some 100 passengers assisted Nature Foundation in cleaning various debris, plastic, fishing tackle and glass for three hours Wednesday morning. 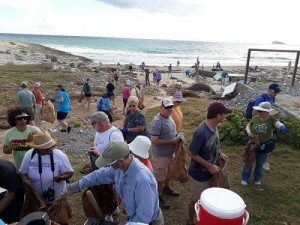 The activity was part of the Fathom and Princess Cruises “Cruise for the Caribbean” and is the first time passengers from a cruise ship to St. Maarten have participated in an impactful environmental activity, according to Nature Foundation. “We were so pleased and honoured to have guests from a cruise ship take time out of their holiday to assist St. Maarten both with an ecological activity and helping us rebuild after the devastating effects of Hurricane Irma. We are so grateful to the whole team and the positive attitude everyone showed while ridding the beach of plastic. It is excellent to see this move towards a sustainable tourism for St. Maarten post-Hurricane Irma,” read a Nature Foundation statement. Guana Bay is listed as the index beach for all three species of sea turtles that nest in St. Maarten. Some three tons of trash were collected and removed from the beach during the clean-up activity. The group also donated to Nature Foundation’s clean-up activities post-Irma. Clean-up supplies were provided by well-known environmental non-governmental organisation 4Ocean which provided gloves, re-usable trash bags and cleaning tools.